In balmy weather, jeans may not be the first item you reach for—especially if your go-to is a vintage non-stretch pair—but you hardly have to abandon the staple altogether in the heat. Instead, lighten up your denim mood with several styles in stark white washes. The light look is bigger than ever this season. 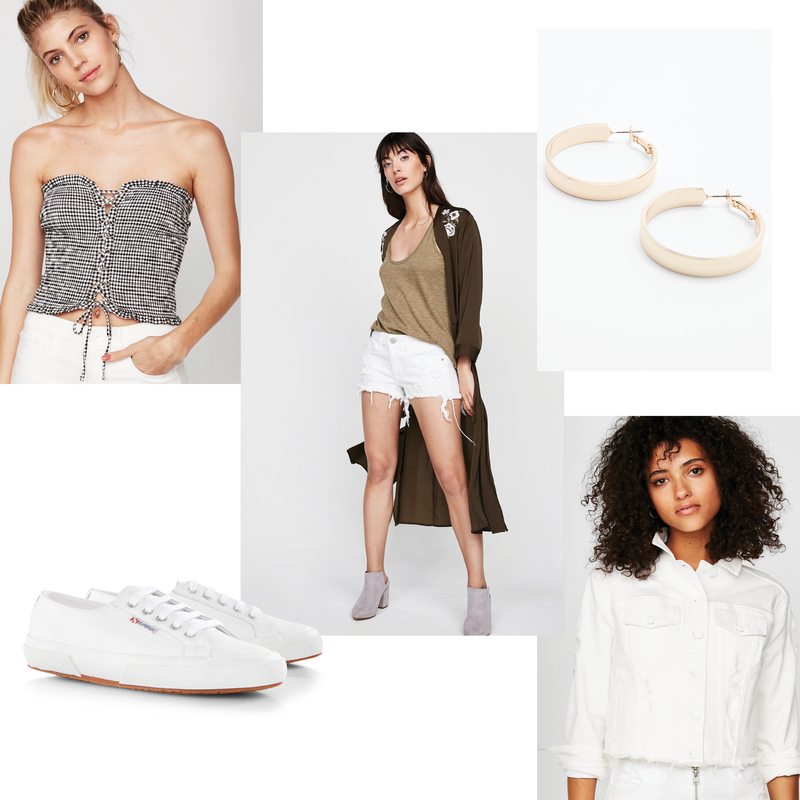 Befitting more occasions than a country club affair or nautical-themed outings, white denim plays well with more pieces in your wardrobe than you might think. From tanks and tees to warm-weather knits and gingham tops white denim should be your summer black denim, i.e. the easiest thing to throw on in the morning. Silhouettes from high-waist flares to distressed skinnies come refreshed in white—feeling decidedly SUMMER for work, weekend, and every occasion in between. And, don’t forget the white denim jacket which is a seasonal hero, too. Toss it over your favorite denim cuts for a crisp head to toe look. 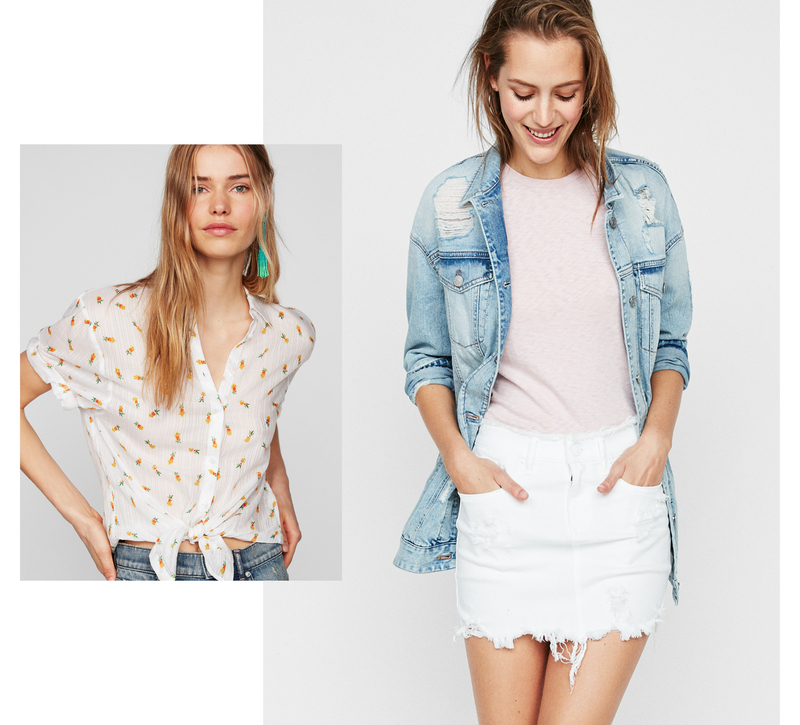 Ahead, five fresh outfits to try now. For a top-to-toe white denim look, team a jacket over raw-edge denim shorts in the optic hue – an ideal look on the weekends or for traveling. With a cropped gingham top, sneakers, and thick golden hoops, the effect is at once laid-back and feminine. Embrace this season’s love for two-tone outfits with a white denim mini and tie-front top in a cheeky print for off-duty chic. Rosy sunglasses and espadrilles are pretty in combination while a geometric-shaped bag with tortoise shell handles add dimension. For date night, go graphic by pairing a voluminous black top with slim white jeans that flare over your heels just so. A woven clutch and sculptural earrings are perfect accents in warm weather while PVC wedges are a playful finish. While running errands, a buttoned-up cardigan in a lightweight pastel is fresh against optic white jeans. A woven tote and minimal slides are perfectly pared back for easy chic. For casual cocktails, an asymmetric tank brings forward effect to a slightly ravaged crop. Golden sandals, filigree hoop earrings, effortlessly dress up the easy separates.